After my husband and I finished putting up the Christmas tree this morning, I discovered that my Dexcom G4 Share receiver was missing. We searched tree branches, boxes of decorations, upstairs, and downstairs and couldn’t find it. I knew that the receiver was somewhere in the house because I was getting numbers on my phone through the Share app. Once my BG hit the stratosphere, I gave up on high alerts. My only recourse was to drop below 55 and get the mandatory audio alert. I injected a mega-dose of insulin and got ready for the gluco-coaster ride. Don’t try this at home, Kids. It took a while but eventually I was below 100 with double down arrows. About this time my husband asked if an ambulance ride would cost more than replacing the receiver. I explained that I had reached my deductible for the year so emergency care would be free…. Then I assured him that I would be okay and ate a couple of Smarties to control the BG drop. We didn’t hear vibrations as the BG dropped below 70. So it was 55 or Bust! Finally we heard muffled audio beeps, but we couldn’t figure out where they were coming from. Certainly not near the Christmas tree or the couch or the many boxes where I expected to find it. I’m not sure how many minutes separate each series of alerts—maybe about ten. Finally on the 3rd or 4th round of beeps, we found the receiver upstairs in the pocket of my pajamas. This should be the end of the story, but it is not. The reason that I had not checked upstairs is that I had been on a 40-minute walk long after getting dressed. I had seen reasonable BG numbers on my Apple Watch while walking and given no thought to the idea that the receiver was not with me. It turns out that obviously my receiver was upstairs all morning and the number I was seeing on my Apple Watch was from the Watch Sugar app. When the Dex Share app on the phone and watch loses contact with the Dexcom receiver, it displays blank dashes instead of numbers. Had I been using this app during the walk, I would have noticed a problem. But I was checking my watch face with the Watch Sugar complication. Well, I learned today that the Watch Sugar app will keep displaying the last number received whether it is 30 seconds ago or 5 hours ago. Once my BG returned to normal according to my meter, I turned off the Dex receiver for 20 minutes. As expected, the number 46 for Watch Sugar never changed while the Dexcom Share app (not shown on watch face) quickly showed no data. Hypothesis confirmed. Everything is now fine in Diabetes Land. I found my Dexcom receiver. My post-Thanksgiving low carb diet got blown to bits with glucose tabs, Smarties, an apple, a pear, yogurt, and an English muffin. I learned that it is better to keep the Dexcom app open on my watch rather than rely on Watch Sugar. My BG’s are stable and back in range. Dexcom 91. Freestyle 93. Just another day with Type 1 diabetes. Postscript: Sometimes I think I have little control over my diabetes. Today I felt totally in charge of what I wanted my blood glucose to do. I never felt that I was doing anything dangerous. I was not alone and I had lots of orange juice and glucose tabs available. That being said— please remember that nothing you read on this blog should be considered medical advice or even good advice. The last D-tech before going on Medicare. In early September I will purchase my last CGM system before going on Medicare in the spring. That will be followed by my final pump selection in early December. Rather than view these decisions with my usual excitement, I sit here with a stomachache of dread, frustration, and uncertainty. I tend to be naive and think that there is a “correct” decision when it comes to things like this, but there is enough going on in both the reimbursement and technology landscapes that I am faced with a lot of doubt. First the CGM. It will be Dexcom for sure, but I am torn between staying with the G5 or going back to G4 platform. Although Dexcom is primarily marketing the G5, I use an Animas Vibe and have the option of staying with the G4 for the foreseeable future. (Please ignore the fact that I rarely use my pump as the CGM receiver. Click here for an explanation.) Currently Medicare does not cover continuous glucose monitoring for seniors with Type 1 diabetes. Many individuals and organizations are working hard for a policy change, but I am discouraged and convinced that I will have to self-fund my CGM starting at age 65. Dexcom has made and continues to make decisions that make self-funding a CGM increasingly expensive. Looking at transmitters, G4 transmitters had a 6-month warranty but many of us experienced a much longer life than that. My most recent G4 transmitter lasted a year. G5 transmitters place a higher demand on batteries, but also have a software-mandated drop-dead date of about 100 days. Thus for someone who self-pays, transmitter costs have almost doubled from G4 to G5. As yet no changes have been made that impact the cost of sensors. Unfortunately as reported at Diabetes Mine last week, the Dexcom CEO brought up the idea of Sensor Auto Shut-off during the latest quarterly earnings call. This was presented as a safety consideration and my initial snarky response was tweeted by Diabetes Hands Foundation: “So we can kill ourselves on Day 1 of a sensor when Dex is at its most inaccurate, but not on Day 11″ bit.ly/2b4fmjx @MNAZLaddie.” In Dexcom’s defense, no one can ignore the financial repercussions to Dexcom of customers using sensors for 2-3 times as long as warrantied. I currently use most of my sensors for about 2-1/2 weeks. I have full insurance coverage for sensors, but experience better accuracy the second week than the first. I often finally change out a sensor for scheduling reasons or because it falls off despite SkinTac and additional tape. Very rarely is it because of performance problems. I doubt that there will be sensor auto shut-off until the G6, but it is another change that will greatly impact those who self-pay. I think it makes sense for me to return to G4 for now, especially since I can use the Share feature to see data on my phone. Going back to carrying a receiver won’t bother me much, especially because I like the alarm profiles of the receiver much better than my phone. I am also tired of keeping my phone with me all of the time. The CGM decision is tangled in my thoughts about a new pump. I am not in love with the Vibe and it doesn’t make sense to buy another one. Tandem is close to retiring the t:slim G4 and I know that if I go with Tandem, I would prefer to buy the t:slim X2 to be released in the fall. The last time I selected a pump for CGM reasons was the Ping in 2012 and it wasn’t a good choice for me. I’ll be writing more about pump musings in the fall, but as with previous pump decisions, it will be complicated by insurance considerations and the uncertain release date of new technology. Medicare rules will also come into play. I sometimes conclude technology posts with the admission that my concerns are a #firstworldproblem. I am a privileged patient when it comes to diabetes and I am grateful. I have some “meatier” blogposts that I need to finish, but I’ve been busy living life and not so busy writing about diabetes. From a “Life” point-of-view, that is good. From a “Blogger” point-of-view, that’s a definite faceplant. Just so February doesn’t fly by with zero blog entries, here are some diabetes things going on in my life. Number One! I lit up Facebook and made many D-friends jealous with the news that I had lunch with Kate Cornell last Thursday in Prescott, Arizona. The skies were blue, the temps were warm, and the company was great. Number Two! I spent quite a while yesterday morning trying to figure out why I couldn’t fill my prescription for insulin. Obviously a #firstworldproblem because I knew that it was just a pharmacy and/or an insurance glitch. That’s a reminder that if you haven’t yet contributed to the Spare a Rose campaign, please click here to donate. It is more than an insurance/pharmacy glitch when children with Type 1 diabetes in developing nations die because they have no access to insulin. Although Valentine’s Day has passed, it is not too late to Spare a Rose to Save a Child. After several phone calls to my endocrinology office and pharmacies in both Minnesota and Arizona, I will be able to pick up my 90-day supply of Novolog tomorrow. Should I mention that the insurance-contracted price is $1103.89 or $275 per vial? In June 2014 I wrote a blogpost titled “Then and Now” and shared a 1977 bill of $3.91 for one vial (a 2-month supply) of Lente insulin. Not much else to say…. Number Three! My sister is flying across the country this week to visit me in Arizona. 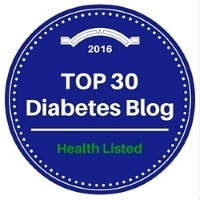 She also has Type 1 diabetes and my interview of her is one of my most-viewed blogposts ever. We couldn’t be more different in our diabetes care. She uses Lantus now only because Lily quit making Ultralente in 2005 and her refrigerator stockpile ran out. She uses Regular insulin as her bolus insulin and has chosen not to use Humalog, Novolog, or Apidra. All of this is with vials and syringes. I of course have used a pump and CGM for years. Fortunately we are both doing well after almost 4 decades of diabetes. Because of my free upgrade to the Dexcom G5, I have several unused Dexcom transmitters. (My current G4 transmitter has been in use for 11 months with no signs of failing.) I am going to ask my sister whether she would like to use one of my G5 transmitters along with her iPhone to try out a Dexcom CGM. I suspect that she will say no, but maybe not. Unfortunately she is older than I am and already on Medicare. Maybe it is cruel to let her experience life with a CGM when she would have to self-pay to continue on the system. Number Four! I have been hiking a ton this winter and playing golf at least once a week. Abby the Black Lab has been enjoying two walks a day. My Fitbit is exploding with steps and I have averaged 18,850 steps (8.5 miles) per day for the last 4 weeks. If only the other parts of diabetes care were as easy for me as exercise. I’d be willing to trade 5,000 steps (or even 8,000 steps!) a day to anyone who would cook me delicious, healthy, low-carb dinners. That’s it for today. Be strong. Be well. Be happy. Keep fighting the good fight and see you around the DOC. It’s been a while since I’ve shared what I am reading and listening to. In the past couple of days I read one blogpost and listened to two podcast episodes that I think are worth your attention. Currently I do not have heart disease although as a woman in her 60’s with Type 1 diabetes, I know that I am at risk. The appeal of this website for me has less to do with heart disease and more to do with the shared experiences of women (really all people) living with a chronic disease. I strongly urge you to read this blogpost and dream about an ideal world where medical professionals no longer blame patients and instead work towards patient health goals with a secondary emphasis on diagnostic test numbers. Juicebox Podcast is an offshoot of the well-known diabetes parenting blog Arden’s Day. In 2007 Scott Benner began sharing life stories after his daughter Arden was diagnosed with Type 1 diabetes at age 2. Scott proudly proclaims that he is a stay-at-home dad and the author of Life Is Short, Laundry Is Eternal: Confessions of a Stay-At-Home Dad. Never one to shy away from a challenge, Benner began a podcast in early 2015 and named it after the numerous juiceboxes his daughter has consumed to treat low blood sugars. Both of these Dexcom interviews were released in August and some of the G5 discussion is a bit dated. A minor point because both conversations are fascinating with insider views of Dexcom’s past, present, and future. I found Sayer’s discussion of the Google/Dexcom collaboration to be particularly interesting with his views on device miniaturization and the possibilities for the Type 2 market. As an adult with Type 1 diabetes, I am not necessarily the Juicebox Podcast‘s target audience—parents of children with T1. Some of Benner’s interviews focus on parenting issues such as 504 plans/talking with school administrators and I skip those. Many are interviews with other T1 parents sharing their unique stories. I listen to and enjoy those podcasts while giving thanks that I live with Type 1 rather than my children. Finally there are interviews with people such as NASCAR driver Ryan Reed, American Idol contestant Adam Lasher, John Costik of Nightscout, and the two Dexcom executives that are interesting to anyone with a connection to diabetes. I subscribe to the Jukebox Podcast through iTunes and new episodes are automatically downloaded to my iPhone podcast app. You can also listen to individual episodes through iTunes. Two and a half weeks ago I surprised myself. I was standing in the pool dodging grandchildren with noodles, inner tubes, and water cannons. Out of nowhere I began to envision the possibility that I might choose to stay with the Animas Vibe when I select my next insulin pump in late 2016. You’re probably thinking “Where in the heck did that come from?” Part 1 of this series was highly critical of the Vibe as a pump/CGM system. Part 2 detailed my frustrations with the klutzy hardware and software integration of the Dexcom G4 into the pump. So how in the world did I get to the point that not only do I not hate the Vibe, I am relatively happy with it. I’ll start with a little history. In late 2012 I left Medtronic for Animas because I wanted upgrade access to the first pump to be released in the USA with a Dexcom integration. I had read a lot about the convoluted menus of the Animas Ping but figured that I would get used to them. Very quickly I figured out that I had greatly underestimated how much I would hate these menus. Over a year later I was still grouchy with my pump decision and frustrated with the constant scrolling, the need to populate each recommended bolus from zero, and the lack of a Back button. One day a couple months ago it dawned on me that I had become so adept at scrolling and button-pushing on the Ping that I didn’t hate it anymore. I still wondered what the Animas designers had been smoking when they designed the software system…. But I didn’t fight it anymore. When I received the Vibe in mid-February, it didn’t take long for me to form negative opinions on the CGM integration into the device. At the same time the insulin-delivery functions of the pump were mostly fine and I daily appreciated the jump-to-bolus feature. In mid-March I quit using the Vibe as my CGM and went back to the Dexcom G4 receiver. This simplified my interactions with the Vibe and my satisfaction with the device increased quite a bit. Very importantly, it eliminated the nagging BG calibration alert. No more beeping after every bolus containing a BG number! I no longer had the frustration of the slow-refreshing graphs and I could mostly stay out of the no-man’s-land CGM menu. I began to concentrate on what I liked about the pump rather than my dislikes. At this point I was content that the Vibe was my pump until late 2016. Would I sign a contract now for the Vibe in 2016? No. But because I will be a few months shy of Medicare when I make my next pump decision, the Omnipod and Snap will be off the table unless Medicare coverage changes. It is unlikely that I will leave Dexcom for the Medtronic CGM, so that essentially takes the newer Medtronic pumps out of contention. (At the same time I was super impressed when a got a chance to see the Medtronic 640G at the UnConference in March.) Accu-Chek is not a good fit for me and I refuse to use a tubed pump that requires a remote controller. So it will be the Animas Vibe versus Tandem (and maybe Medtronic?). Let the battles begin! One thing that I have not talked much about in this post is the decision to leave the Ping to upgrade to the Vibe. Many Animas pumpers (or parents of pumpers) rely on the meter remote of the Ping and the lack of one becomes a deal breaker for the Vibe. I hated the remote and it was relegated to a dark closet several years ago. In my book everything about the Vibe is equal to or better than the Ping. At the bottom of the post, I have attached a link to a sheet that I received from Animas highlighting the differences between the Vibe and the Ping. A lot of the changes relate to the addition of the CGM functions. The biggie for me is the one-button bolus population. I also like the ability to see my IOB with one button push. There are other menu changes that aren’t important to me and I still goof up with some of the new navigation arrows in the Setup, Status, and History menus. I have no interest in the Food list which is now in the pump, but others might like that feature. In summary, I am mostly happy with the Vibe. For me it is a sturdy, reliable, waterproof pump that is not overly aggravating when I don’t activate the CGM functions. At the same time I believe that Animas missed the opportunity to design and release a pump which could have hit a home run in the diabetes tech world. I have no idea if there are new pumps in the pipeline at Animas, but I hope so. As we see feature-rich pumps such as the Medtronic 640G and offerings from Tandem, Assante, and Omnipod hit the market, it is my opinion that the Vibe longterm will have a shrinking share of the insulin pump market.